The sliding/tilting roof is operated with the rotary switch » Fig. 38 on page 54 and only works when the ignition is switched on. The control dial has several positions. The sliding/tilting roof can still be opened, closed and tilted for approx. 10 minutes after switching the ignition off. However, as soon as one of the front doors is opened it is no longer possible to operate the sliding/tilting roof. Close the sliding/tilting roof carefully – risk of injury. During the winter it may be necessary to remove any ice and snow in the vicinity of the sliding/tilting roof before opening it to prevent any damage to the opening mechanism and seal. If the battery has been disconnected and reconnected, it is possible that the sliding/tilting roof does not close fully. This is why the rotary switch must be set to position A » Fig. 38 on page 54 and pressed forwards for about 10 seconds. Turn the switch to position C » Fig. 38. Turn the switch to position B » Fig. 38 and hold it in this position (springloaded position). Turn the switch to position D » Fig. 38. Turn the switch to position A » Fig. 38. The sun blind is operated manually. The sliding/tilting roof is fitted with a force limiter. If an obstacle (e.g. ice) prevents closing, the sliding/tilting roof stops and opens completely. The sliding/ tilting roof can be closed completely without the force limiter by pushing the switch in position A » Fig. 38 forwards until the sliding/tilting roof is completely closed » page 54, in section Introduction. When the sliding/tilting roof is in the comfort position, the intensity of the wind noise is much less. When the sliding/tilting roof is in the comfort position, the intensity of the wind noise is reduced. An open sliding/tilting roof can also be closed from the outside. The closing operation stops immediately when you release the key or the lock button. Close the sliding/tilting roof carefully – risk of injury. The force limiter does not operate with the convenience closing. The sliding/tilting roof can be closed or opened manually if the system is faulty. The emergency operation of the sliding roof is located underneath the glasses storage box 1 » page 83, Glasses storage box. Open the glasses storage box. 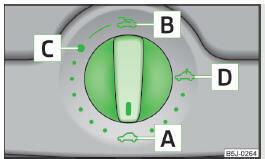 Carefully insert an approximately 5 mm wide screwdriver into the slot in the positions shown by the arrows 1 » Fig. 39. Carefully fold the glasses storage box downwards by gently pressing down and turning the screwdriver. Insert an Allen key, SW 4, up to the stop into the opening 2 and close or open the sliding/tilting roof. Reinstall the glasses storage box by first inserting the plastic plugs and then pushing the entire part upwards. It is necessary after each emergency operation (using the Allen key) to move the sliding/tilting roof into the basic position. This is why the rotary switch must be set to position A » Fig. 38 on page 54 and pressed forwards for about 10 seconds.